12 | TH E M R EP O RT TAKE 5 business side. I think it's going to take a little while to get there because, of course with TILA- RESPA, so the industry has had a little bit of a delay, but once these things get implemented it will be a more steady state for business. So the regulatory environment isn't completely calm but it will be calmer. M // The homeownership rate ap- pears to have "bottomed-out," according to the most recent M // What can market watchers look forward to over the next year? CALABRIA // Ultimately, wage growth and employment growth matter more than anything. People without jobs or people who aren't getting raises are much less likely to get a new mortgage or buy a house. In the coming year, we look forward to the expectation of an improving labor market. The other thing to look forward to is that interest rate increases have a silver lining. While I expect the Federal Reserve to continue to raise rates and that mortgage rates will inch up, I also expect that to mean that capital will come in from the rest of the world and some of that will go into the mort - gage market, which will increase availability. M // Compliance has been one of the biggest hot topics in the mortgage industry, will it con- tinue to be under a new adminis- tration? CALABRIA // From the industry's perspective, the plus to the election will be that you'll see a little more settling down in the regulatory structure, so everybody will start getting used to the differences in TILA-RESPA solutions and servicing rules. When was the last time the industry experienced five to six years of nonstop change in regulatory structure in the mort - gage market? The answer might be never. So its certainly been a regulatory onslaught that has been costly in terms of compliance. For good or bad, it's going to slow down. In terms of trying to figure out—the industry is not going to be in an environment anymore where they just changed all their systems and now they are going to have to change them again. 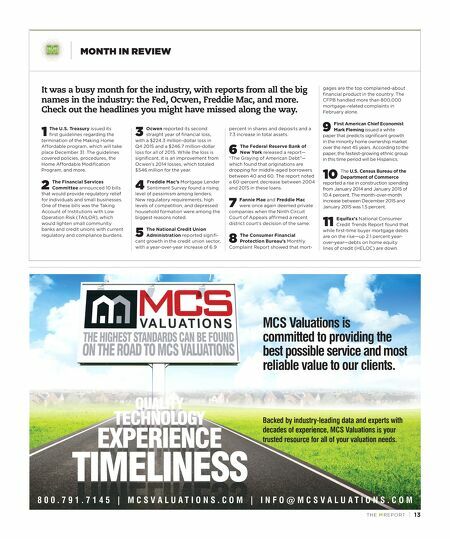 M // There are many regulations circulating in the mortgage in- dustry right now, which of these currently has your attention? CALABRIA // I do think the regulatory side is going to get a little more certainty. 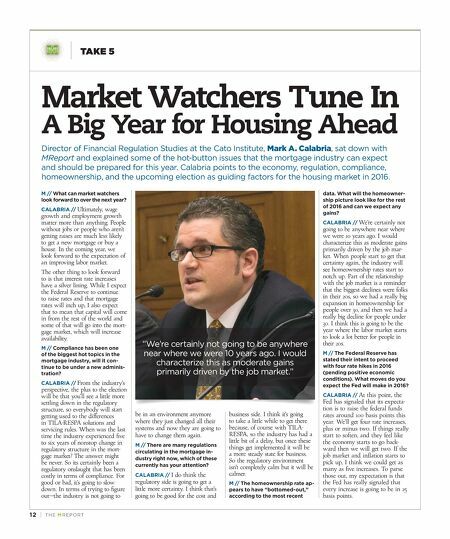 I think that's going to be good for the cost and Market Watchers Tune In A Big Year for Housing Ahead Director of Financial Regulation Studies at the Cato Institute, Mark A. Calabria, sat down with MReport and explained some of the hot-button issues that the mortgage industry can expect and should be prepared for this year. Calabria points to the economy, regulation, compliance, homeownership, and the upcoming election as guiding factors for the housing market in 2016. data. What will the homeowner- ship picture look like for the rest of 2016 and can we expect any gains? CALABRIA // We're certainly not going to be anywhere near where we were 10 years ago. I would characterize this as moderate gains primarily driven by the job mar - ket. When people start to get that certainty again, the industry will see homeownership rates start to notch up. Part of the relationship with the job market is a reminder that the biggest declines were folks in their 20s, so we had a really big expansion in homeownership for people over 30, and then we had a really big decline for people under 30. I think this is going to be the year where the labor market starts to look a lot better for people in their 20s. M // The Federal Reserve has stated their intent to proceed with four rate hikes in 2016 (pending positive economic conditions). What moves do you expect the Fed will make in 2016? CALABRIA // At this point, the Fed has signaled that its expecta- tion is to raise the federal funds rates around 100 basis points this year. We'll get four rate increases, plus or minus two. If things really start to soften, and they feel like the economy starts to go back - ward then we will get two. If the job market and inflation starts to pick up, I think we could get as many as five increases. To parse those out, my expectation is that the Fed has really signaled that every increase is going to be in 25 basis points. "We're certainly not going to be anywhere near where we were 10 years ago. I would characterize this as moderate gains primarily driven by the job market."